Knowledge is all about your Style. This software is made for the students who are just a beginners at Web-Designing. This Software software have many features that provide you reliability and easy to use experience. I have made this software in VB 2010. The Importance of this software is, it is less in size and easy to use. Just enter the code and press ALT + R and that's it. You will get the output in output area. No longer process of saving and opening in browser. If you like this software then like me on my Facebook account. Thank you. *Note : If you have any problem or if you found any errors or wanna add some new features then just contact me and give suggestion. In this new version, you can manually run the code. I have updated this because in some CSS type code it generate an error. So I have done it manually. 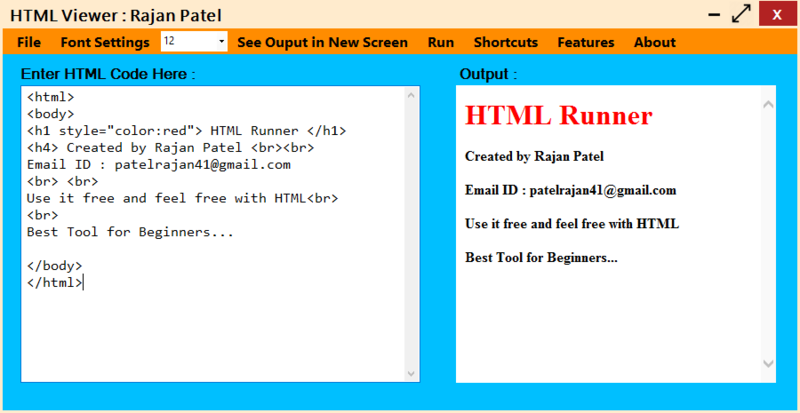 Without browser you can easily run HTML code. No problem of long processes. On just one click you get the output. User can open files from any extension. Supported Extension for Open File : (.txt,.htm,.html,.vb, etc). The File that contain the HTML code that can be opened. If User's output is big in screen size then User can use See output in new Screen option. User can change the font size and other font related options. * If you don't have .NET Framework 4 Client Profile and Windows Installer 3.1 then Download it from given Links below. * Install the Software on your system, if it gives error then you don't have the anyone of this software installed on your system. In HTML Viewer 1.0, there is one more option that is you can automatically get the output. No need to press ALT + R. When text changed it automatically generate output. Problem : Some times it generate error when working with the CSS. So new version of this software is developed. *There are some technical issues with this link.